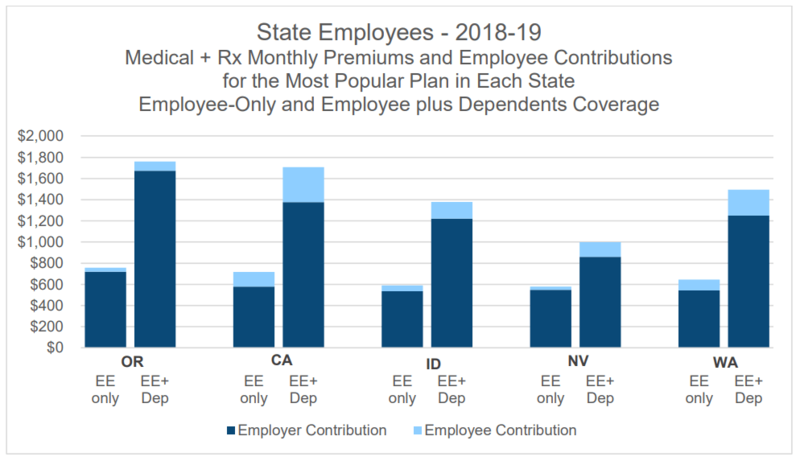 Actuarial firm Milliman recently released a report comparing the health benefits offered to state employees and teachers in five Western states. The report came at the request of the Oregon Business Council Charitable Institution (OBC) and specifically evaluates health benefits for Oregon public sector employees compared to Idaho, Nevada, Washington, and California. Overall, the report reveals significant differences between the evaluated states. 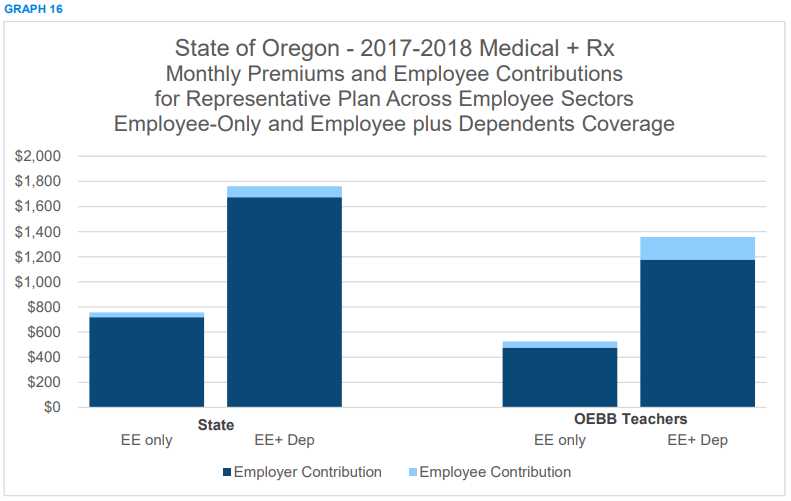 Data from the report shows that Oregon has the highest health benefits average premium costs ($1,404 PEPM) for state employees compared to other neighboring states — both in terms of employee-only, and employee plus dependents coverage. But, by comparison, Oregon state employees pay a lower percentage of those medical premiums through paycheck deductions. On average, Oregon state employees contribute 3 percent to premiums. The comparison states’ employee contributions range from about 10-20 percent. For the most popular state employee plan, on average Oregonians pay the same percentage with or without dependents. The report reveals medical benefits options for state employees in Oregon have a relatively high Actuarial Value (AV) compared to other neighbor states – meaning a greater portion of total medical costs will be paid by the insurer. California has the highest average AV and Oregon has the second highest at an average 93 percent. Comparisons of health benefits for teachers are not as straight forward — likely due to the variation in available funding to school districts and the decentralization of decision making to the individual districts. The actuarial report only compared Oregon to California and Washington to evaluate teacher health benefits. In general, medical premiums were lower for Oregon teachers than California or Washington. The report found there is a wide variation in the percentage of premiums paid by teachers in the comparison states, but that Oregon is consistently in the middle of that range. For dependent coverage, teachers in some Washington and California districts pay between 22 percent and 45 percent of the premium. By comparison, Oregon teachers pay on average 12 percent in districts with tiered premiums. The report also compared state employees to teachers within Oregon. Premiums are generally lower for teachers than state employees. For employees without dependents, premiums for teachers average $525 PEPM and average $750 PEPM for state employees. Of those without dependents, state employees contribute about 5 percent of premiums and teachers contribute around 9 percent. Premiums are also higher for state employees with dependents and they contribute on average 5 percent of their premium. Teachers with dependents contribute an average of 12 percent.